Philippine Azkals lineup for the 2018 FIFA World Cup and 2019 AFC Asian Cup Qualifiers (+qualification structure) - Balita Boss! 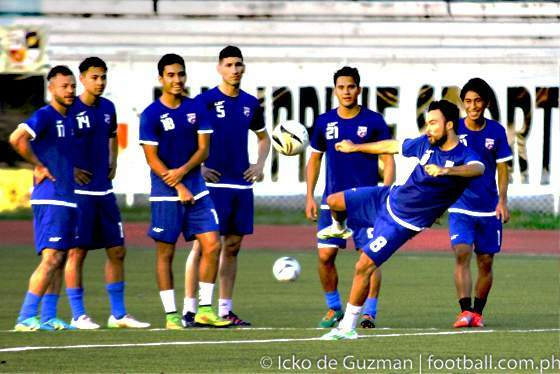 The road to the 2018 FIFA World Cup in Russia and 2019 AFC Asian Cup in United Arab Emirates has already begun for the Philippine Azkals or the Philippines national football team. Based on the FIFA World Rankings of January 2015, ranked 1st to 34th from 46 nations from the AFC were bye in the First round. The Philippines was ranked 17th. In round two of World and Asian Cup qualifiers, the Philippine Azkals were drawn into Group H which also includes Uzbekistan, Bahrain, North Korea and Yemen, which took place in Kuala Lumpur, Malaysia on Tuesday, April 14. Here's the full draw for the #WC2018/ #AC2019 qualifiers! Are you happy with YOUR Nation's group? A total of 40 teams (teams ranked 1–34 in the AFC entrant list and six first round winners) will be divided into eight groups of five teams to play home-and-away round-robin matches. The eight group winners and the four best group runners-up will advance to the third round of 2018 FIFA World Cup qualification as well as qualify for the 2019 AFC Asian Cup finals. The 12 teams which advance from the second round will be divided in two groups to play home-and-away round robin matches. The top two teams of each group will qualify for the 2018 FIFA World Cup, and the two third-placed teams will advance to the fourth round to play home-and-away over two legs. The winner will advance to the inter-confederation play-offs. The next 16 highest ranked teams from the second round will advance directly to the third round of Asian Cup qualification. The remaining 12 teams enter the play-off round to contest the remaining eight spots in the third round of Asian Cup qualification. Here's the 23-man team of the Philippine Azkals that will be representing our country in the upcoming 2018 FIFA World Cup and 2019 Asian Cup Qualifiers.